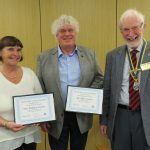 The Rotary Club of Warwick presented its annual Meritorious Service Award to Mike and Barbara Cornes of Warwick Ambulance Association at their meeting on Wednesday January 9th, in recognition of their voluntary work for the local community. Rotarian Jackie Crampton introduced Mike & Barbara to the club, several of whom had known them for many years. They started volunteering about 28 years ago in first aid and have also fostered children over a similar period. This is an amazing contribution to the community of Warwick, for which many must be grateful. Mike & Barbara decided to learn first aid after a family emergency when they didn’t know what to do, or more importantly what not to do. They joined the Warwick Ambulance Association as volunteers providing first aid cover and training courses for local people and Mike is currently Chair and co-ordinator. At one time affiliated to St John Ambulance, in 1988 Warwick Ambulance Association (WAA) was established as a Voluntary Registered Charity, with First Aid and support to the community as their main aim. The association is based on the Emscote Road near to Tesco. The Rotary Club regularly uses them to provide cover to events such as Pancake Races, Bonfire Night, and Carols at the Castle. Warwick Ambulance earns money from supporting events such as Motor-cross, and Pop concerts and has a fully trained team and fleet of vehicles. They recently provided cover for the Riding for Disabled Championships in Gloucestershire. Mike described that experience as inspirational and said that as volunteers you get back a sense of satisfaction when you give your time to help others. President David Smith expressed admiration for their tireless work on behalf of the community of Warwick and presented both Mike and Barbara with a framed certificate and a cheque for £200 towards the work of Warwick Ambulance Association.